India vs New Zealand, 2nd T20I: With the momentum on their side, New Zealand cricket team can do the same kind of damage to the Indian team yet again in the second T20I which will be played on Friday at Eden Park, Auckland. Indian team can only get a result from tomorrow's rubber if its batsmen shake off the complacency and the bowlers put together a stoic performance. India vs New Zealand, 2nd T20I: Indian cricket team was riding high on confidence after mauling New Zealand in One Day International (ODI) series and expectations were sky high from the Indian side to deliver the same swashbuckling performances in Twenty 20 International (T20I) series against the Black Caps, but something very contrary happened in the first T20I on Wednesday. 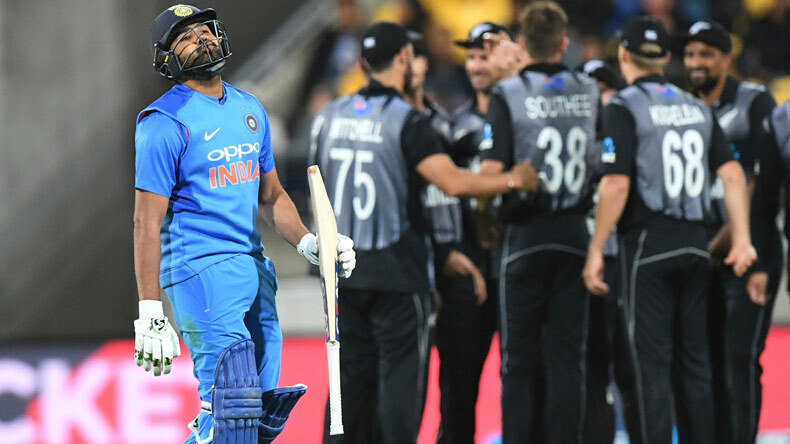 A red-hot Team India was gunned down and brought to the ground by a New Zealand side which fired on all cylinders in its 80-run win. While giving their assessment of the match in a post-match conference, Indian skipper Rohit Sharma admitted that his team was outplayed in all three departments by the opponent. His New Zealand counterpart Kane Williamson said that it was a complete performance that doesn’t happen every day. Indeed, the occurrence of such all-round performance by the Kiwi side has been rare so far in the series, but the home side has all the mettle to shellshock a rather complacent Indian team yet again. Indian team is apparently missing the monumental presence of Virat Kohli, who has been rested for the 3-match T20I series, while the hero of the recently-concluded ODI series, Mohammed Shami was also not there in the first T20I. Team India named eight batsmen in the opening match condoning the importance of bowlers. Tim Seifert, a rookie by numbers before the match, blew away the Indian bowling attack with his 43-ball blitzkrieg in which he smashed 6 sixes and 7 boundaries scoring crucial 84 runs. Other Kiwi batsmen made a healthy contribution helping their side to a super total of 219 runs in 20 overs. India’s decision to go with so many batsmen backfired as a fiery New Zealand bowling line up made light work of the visitors. Only four Indian batsmen managed to take their score to double figures as the entire team was bruised and dismantled at a score of 139 runs. With the momentum on their side, New Zealand cricket team can do the same kind of damage to the Indian team yet again in the second T20I which will be played on Friday at Eden Park, Auckland. Indian team can only get a result from tomorrow’s rubber if its batsmen shake off the complacency and the bowlers put together a stoic performance.